We are delighted to announce that we have TEAMED up with Wild Rover Tours to offer you a unique service that will see you picked up from our doorstep and delivered safely to one of Ireland’s many cultural and historical treasures. Just imagine stepping out of bed, enjoying a full Irish-breakfast that will set you up for the day, step out the front door and begin a journey that can take you to such mystical places as the Burren Coastal Drive, The Cliffs of Moher or the romantic cobbled streets of Galway City. These doorstep to land/sea scape one-day tours offer you the luxury of enjoying a single transport experience, no hopping on and off, just sit back and enjoy the Wild Rover Tour experience. Imagine a day trip to the Wicklow Mountains or Glendalough in Kilkenny, where you can enjoy the richness of Irish culture and tradition, you can snap the rustic land/sea-scape carved by the rigours of time. 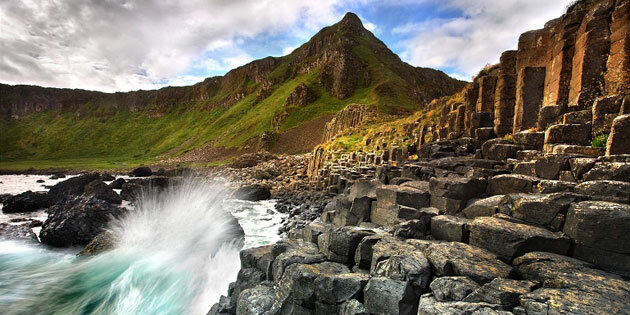 These doorstep tours can take you in comfort to the sea washed and mythological soaked shores of the Giant’s Causeway, watch as the sea washes over the hexagonal prints left by the great giants of Ulster folklore. Why not journey to the Titanic Quarter in Belfast and browse over the now romantic story of the great ship Titanic etched in the chronicles of time by the great movie classic so beautifully acted out by Leonardo De Caprio and Kate Winslet. Our doorstop pick-up can also transport you to a less romantic time in Irish history, one that is still too often played out on the streets of the north of Ireland, the Belfast City Political Walking Tour, takes visitors around areas that will be known mainly from news reports over the past 40 years. For those who wish to keep up to date with political and current affairs this political tour is a must, however, each visitor must make their own interpretation about what did or did not happen in the north of Ireland, so often, history has its own way of re-writing itself. The Glens of Antrim Drive, Galway Bay, Aran Islands all offer their own unique chapter in the culture and history of Ireland’s unique land/sea scape. Whatever trip you take be that a coastal trip, and historical tour or a combination of both, you can be certain of safety, security and luxury as you get picked up on our doorstep and delivered to your place in time and history. Even if you are not staying with us, but wish to wait for the doorstep pick-up, everyone is welcome to step into our premises and enjoy a value for money breakfast.